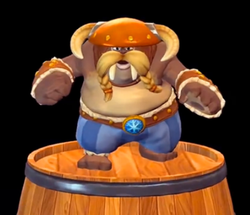 Walnuts are members of the Snowmad army and enemies appearing in Donkey Kong Country: Tropical Freeze. They are Waldoughs that wear blue trousers, an orange helmet, and a leather wristband on each hand. Walnuts slowly walk back and forth, and their helmet protects them from any jump attack. However, the Kongs can attack and defeat Walnuts by performing three roll attacks, throwing a barrel or using Rambi. Their helmet is not impervious from Cranky Kong's Cane Bounces, therefore they can also be used to defeat Walnuts. This page was last edited on September 24, 2018, at 18:03.